NASA's long-suffering Kepler Space Telescope returned to sleep mode just a few days after its most recent observing campaign began, the agency said in a statement released yesterday (Oct. 23). 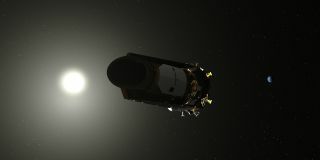 "Following a successful return of data from the last observation campaign, the Kepler team commanded the spacecraft into position to begin collecting data for its next campaign," the NASA statement read. "On Friday October 19, during a regularly scheduled spacecraft contact using NASA's Deep Space Network, the team learned that the spacecraft had transitioned to its no-fuel-use sleep mode." Engineers working on Kepler have been worried about the spacecraft's fuel supplies since this spring, and in recent months the telescope has conducted only partial observing campaigns, then fallen asleep to ensure it has enough juice to send the data back to Earth. Despite the recent struggles and impending end of the mission, Kepler has been an overwhelming success and is now an iconic NASA project. When the spacecraft first launched in 2009, its mission was designed to last just one year. Instead, its mission continued until 2013, when mechanical troubles meant engineers had to replan its mission into a successor campaign called K2. Between the two missions, the spacecraft has identified more than 2,650 confirmed planets orbiting stars, proving that such exoplanets are far more common than scientists had ever dreamed. While Kepler will leave large shoes to fill, a new telescope has already begun taking over its work hunting for alien planets. That mission, the Transiting Exoplanet Survey Satellite, or TESS, launched in April and has already identified two candidate planets — of what scientists say may be 10,000 in the first two years.